Comments: Deciduous broadleaf from China. 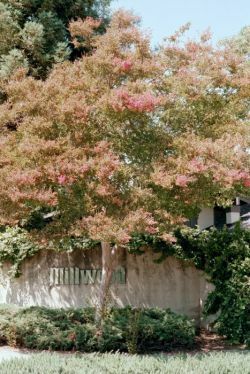 Low growing tree with bronzy-green leaves and bark. Mature trees to 20' but mostly smaller in this area. Large clusters of long lasting magenta, pink or white colored flowers in summer. Lagerstroemia incica is crossed with L. fauriei or L. speciosa to change flower colors and other characteristics of the parent plants.